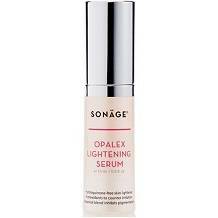 This review focuses on the skin-lightening product, Opalex Lightening Serum manufactured by Sonage. The claim is that this product has been formulated to deal with hyper pigmentation as well as dark spots. In addition, this company claims that antioxidants have been added to counter the problems of redness and irritation. Continue reading this review to learn the facts about this product. Alpha-arbutin helps to delay the production of pigment, whereas other ingredients such as licorice root extract, azelaic acid and kojic acid help to lighten dark spots. White mulberry bark extract and the citric extracts, as well as apple fruit extract, are all sources of antioxidants. Other ingredients such as cucumber extract help to hydrate the skin. Sodium hyaluronate helps to retain moisture in the skin, making it looking fresh. This product’s formula is free from parabens and is a cruelty-free product. Ingredients are botanical and not non-comedogenic. User instructions are clear and simple. The company that makes this skincare product states that the product, which is a serum, should be applied either once or twice per day. However, the company fails to state under which circumstances a consumer should apply this product and whether once or twice daily. It may be applied under a moisturizer. This product should be used consistently for a minimum of 12 weeks. A sunscreen should be used. This product is available online on the company website at $48.00. No discounts nor any bulk offer deals are offered. The manufacturer does offer a 14-day money-back guarantee on this product. However, the product must be unopened. The consumer should send through the proof of receipt and have authorization from the manufacturer to return the product. Cost of the return shipping fee is not covered, and 20% is deducted from the refund as a restocking fee. There are positive aspects to the product Opalex Lightening Serum. The 14-day money-back guarantee allows consumers to receive their money back should they no longer want the product. However, this guarantee does not allow the consumer to test the product. User instructions are relatively clear. However, this product comes without any discounts or package deals that would have saved the consumer money in the long run. This product also lacks patented and clinically proven ingredients. Such an omission questions the quality of the product. With this as background, it should also be mentioned that there are many other similar products on the market, but most of these product are packed with clinically proven and patented ingredients that are not only known to be effective but have been proven to be effective, but also very attractive incentives such as package deals and discounts, also many positive customer reviews of their products and clear and easy to use instructions of how to use their products.